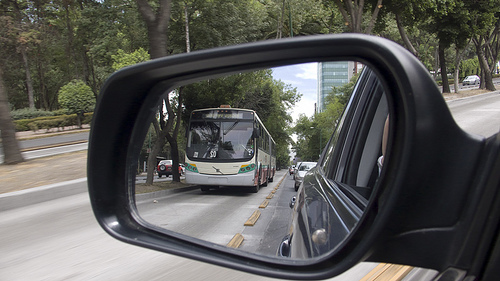 Mexico City's Metrobus has lead to a 15 percent mode shift from cars to public transport. Photo by Eduardo Ortiz. This post is part of a series covering the 2011 Sustainable Transport Symposium in Kocaeli, Turkey from April 6-8, 2011, an event hosted by EMBARQ, the producer of this blog. The second day of the symposium included sessions on BRT and rail systems, transport finance, emissions and road safety. Dario Hidalgo, director of research and practice for EMBARQ (the producer of this blog), kicked off the day with an overview of bus rapid transit and review of worldwide BRT systems. Hidalgo said that “traditionally we tried to solve the problems facing cities (accidents, pollution, congestion) by building more road capacity. But that is like trying to cure obesity by expanding the size of your pants. We are not able to build our way out of congestion. And those that try tend to consume more energy per capita.” Cities, like those European cities presented on Day One, use less energy. The U.S. consumes more. And as Hidalgo said, Turkish cities can choose which path to follow. Sustainable transport solutions aim to avoid trips, shift trips to walking, biking and public transit, and improve the efficiency of existing systems and technology. Bus rapid transit systems are one important component of sustainable transport. Hidalgo defined the key elements of BRT: exclusive lanes, full stations not just bus stops, level boarding, large buses with multiple doors, centralized control and a distinctive image. He also reinforced that bus systems can be high quality, user-oriented, fast, reliable and low-cost transport solutions. Hidalgo highlighted Curitiba and Bogotá’s famous BRT systems and shared examples of lesser known BRT systems from across Latin America. He pointed out that cities don’t need wide right of ways, like Bogotá and Istanbul have, in order to implement BRT. After all, Pereira, Colombia’s Megabús operates on very narrow one-way downtown streets. Hidalgo says cities just need to make the decision to prioritize bus passengers in whatever space they do have. Hidalgo went on to summarize the remarkable growth the BRT industry has experienced over the last 10 years. BRT used to be a little known concept, and now many cities around the world are considering BRT as a sustainable transport option, and for good reason. With their sustainable transport policies, Bogotá has been able to curb use of cars, keeping transit and non-motorized transport mode shares high, while reducing road fatalities. Yorgos Voukas, CTS-Mexico’s director of integrated transport, continued the discussion of co-benefits of BRT systems by sharing the story of how the Metrobus BRT system helped transform Mexico City. With a population of about 20 million, Mexico City has 50 million daily trips on all transport modes. Voukas said that for every child born in Mexico City, two cars enter the roadways. That’s 200,000 cars per year, leading to congestion, an estimated 440 million tons of CO2 per year and 2,172 road fatalities. Metrobus, Mexico City’s 67-kilometer BRT system moves 600,000 passengers per day and has lead to a 15 percent mode shift from cars to public transport, an equivalent of 72,000 people leaving their car each day. Metrobus is one of the few BRT systems in the world receiving carbon credits for its CO2 reductions; it receives $192,000 per year. Furthermore, travel times have improved along the Metrobus corridors by 40 percent to 50 percent, and along Insurgentes Avenue alone, there has been an 84 percent reduction in annual road fatalities. Voukas pointed out that this transformation has not been easy. The private bus operating companies and government sometimes have competing interests, so patience and understanding were required. But in the end, the individual bus operators who later became the Metrobus operating companies benefited from more organized bus operations, economies of scale, financial solvency and better working conditions. The government provided a more regulated, safe and accessible public transport system, and users gained a high quality public transit service. Metrobus will continue to transform Mexico City, as it is expanded from three to 10 corridors. 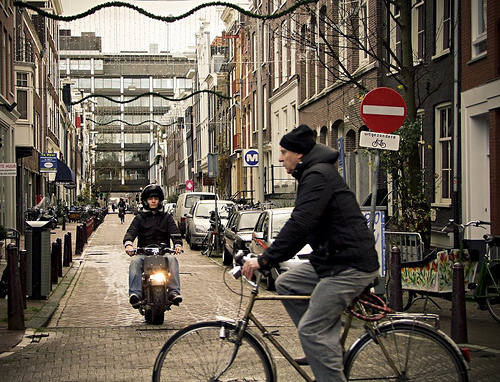 The majority of trips in Amsterdam are made by non-motorized modes. Photo by Kimberly Jones. Remco Suk described Amsterdam’s transport system, which features national and regional rail, metro, trams and buses. For 35 years, the city’s transportation policy has focused on reducing car use, and increasing bicycling and public transport. One way the city has tried to achieve this is by setting minimum design and performance requirements for the car, bike and rail networks. For instance, there are minimum speed targets for each mode. As a result, public transport and bicycles really compete with the car since they are just as fast in town. Amsterdam has also effectively used parking pricing to influence travel behavior and choices. Charging €5 per hour for parking in the city center helps shift trips from autos to non-motorized transport and public transit. Amsterdam boasts nearly an equal mode split between public transport, bicycling and cars, and 60% of Amsterdam’s mobility is non-auto. According to Suk, bicycling really dominates short trips in the city, while public transport and cars are used for medium- to long-distance trips. According to Abdulmuttalip Demirel, the Kocaeli Metropolitan Municipality, with a population of about 1.5 million, currently has unregulated transit fares and bus routes that are not well integrated. The Municipality is developing plans for an integrated public transport system and has begun to make initial improvements. Officials recently made study tours to Transport for London to learn about bus driver training guidelines, as well as to Mexico City to learn about the Metrobús BRT system. Bus stops have been upgraded to modern and accessible bus shelters and a “smart stop” passenger display with next bus arrival information is being piloted at certain bus stops. Kocaeli will make further improvements by restructuring the city-wide bus routes into a regulated system with a single transport operating company and automatic fare system. The second session of the day looked at transport project finance mechanisms. David Willecomme shared the French Development Agency’s (AFD) approach to supporting global sustainable cities. The agency aims to strengthen local capacity, improve urban living and promote sustainable territorial development through urban transport projects. AFD invests or loans €7 billion per year, and there are currently 30 AFD-supported urban transport projects in progress or consideration, including BRT, light rail and metro projects. Willecomme shared three examples of AFD-funded urban transport projects. Amman, Jordan is constructing a system of 40 kilometers of light rail and 52 kilometers of BRT in order to shift trips to public transit. 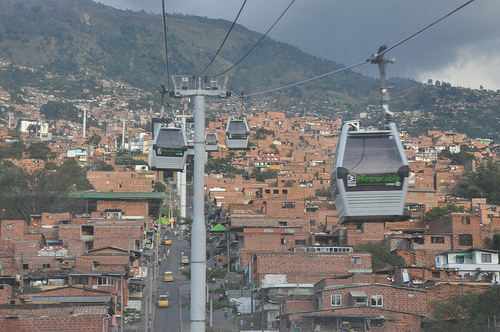 An urban regeneration project in Medellin, Colombia included one tram and two Metrocable lines linking the city center with poorer areas in the surrounding hills. AFD supported transport and open space improvements along Curitiba’s linha verde BRT corridor to reduce CO2 emissions and protect native flora and fauna species. Metrocable reaches the least developed suburban areas of Medellin, Colombia. Dr. Ahmet Keşli, from a Turkish organization called International PPP Platform, discussed the application of public-private partnerships (PPP) to sustainable urban transport. Dr. Kesli claimed that between 2020 and 2023, TL 500 billion ($330 billion) are needed to meet Turkey’s infrastructure needs. These public funds are not available, so innovative financing options are needed. PPP is one possible financing instrument. As the U.S. Federal Highway Administration explains, public-private partnerships are contractual agreements formed between a public agency and a private sector entity that allow for greater private sector participation in the delivery and financing of transportation projects. There are many different PPP models, each with different distribution of risks between the public and private parties that can be used to support new transport projects, or operate or expand existing infrastructure or services. Dr. Kesli pointed out that globally the transport sector uses PPP more than other public sectors, and it has potential to be a successful model for developing sustainable transport in Turkey. Rochelle Sobel of the Association for Safe International Road Travel (ASIRT) opened the third and final session with a discussion about road safety. She has a very personal perspective on road safety, as her 25-year-old son, Aron, was killed in a bus crash on Turkey’s Bodrum-Izmir Highway in 1995. ASIRT was founded in response to this crash, to promote local road safety through education and advocacy. In Turkey there is an urgent need to address road safety as each year 10,000 people are killed and 200,000 are injured in road crashes. One third of these deaths are from vulnerable road users, including pedestrians and cyclists. Turkey’s road fatality rate is 3 to 6 times higher than other EU countries. Sobel suggests factors contributing to Turkey’s crash rate include lack of priority given to pedestrians, better road infrastructure that encourages drivers to speed, and lack of bus safety. ASIRT’s goals in Turkey include supporting governments with the implementation of good practices to reduce road fatalities and injuries, focusing on reducing vehicle speeds and increasing seat belt usage. Sobel reminded the audience that the UN Decade of Action for Road Safety will be launched May 11, 2011, and called on participants to commit to making road safety a priority in their municipalities. Finally, Dr. Alper Unal, assistant professor at Istanbul Technical University, shared results from an Istanbul vehicle emissions inventory he completed in partnership with EMBARQ. The researchers concluded that a suite of solutions are needed to curb transport sector emissions. For instance, new vehicles should have strict emissions standards, and technological solutions were needed to curb particulate matter (PM) emissions from buses. Diesel particulate filters were tested on local buses and reduced PM by 98 percent and other pollutants by 60 percent. Dr. Unal’s team also measured personal exposure to particulate matter on Istanbul’s Metrobus BRT buses and found that the concentration of particulate matter was higher on conventional buses than the BRT. Since personal exposure is a function of the concentration of the pollutant, and the amount of time a person spends in the polluted environment, personal exposure to PM is lower on the BRT system since the travel time is so much lower compared to the conventional bus system. Dr. Unal concluded that BRT is an effective way to reduce exposure to PM in Turkish cities.